What is PRANA ENERGY THERAPY ®? What is PRANA ENERGY THERAPY ® ? The PRANA ENERGIE-THERAPIE® by Hubert Leitenbauer is conducting an effective contactless prana healing method. . The PRANA ENERGY-THERAPY® is clearly combined in their implementation and with conventional medicine and other healing systems. . 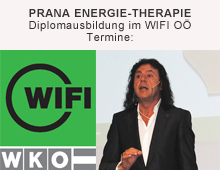 The PRANA ENERGY THERAPY ® after passing Hubert Leitenbauer is an effective non-contact prana healing method. This specially designed spiral techniques come with the spiral Farbpranas required for the application. The PRANA ENERGIE-THERAPIE® is clear in its implementation and with conventional medicine as well as combined with other healing systems. The PRANA ENERGIE-THERAPIE® is applicable to themselves and other people as well as in animals. the energy system of the body affected, Organe bzw. Body parts removed and fresh, pure life energy (=Prana) transferred in this. Through the application of effective techniques spiral and spiral Farbpranas the self-healing powers are activated again. In this case, the used PRANA Energie-THERAPEUT not its own energy, but he takes on fresh prana from the inexhaustible energy source of the universe and transmits them to the client. This is done with the power of the Spirit without touching the body and is, under certain conditions on the possible distance. The PRANA ENERGIE-THERAPIE® can be used for acute and chronic physical and mental disorders of all kinds. It contributes to the overall well-being is essential and also in health care is of great importance. The application of PRANA ENERGIE-THERAPIE® can be accelerated considerably the regeneration process after surgery. In agriculture and horticulture is the PRANA ENERGIE-THERAPIE® applicable. Similarly, spaces and objects can be cleaned energetically, be energized and programmed objects in addition spiritually. Basically, our bodies are by nature awareness and the gift has, to heal itself and regenerate. The human body can only heal itself, So no one can heal another. All healing methods are tools to support self-healing of the sick people. The life energy is the energy, no living thing can exist without the. It affects both the physical and the subtle body. This life force is known under various names, from. B. Prana, About, That, Orgon, Od and Ruah. A rapid activation of self-healing is achieved, by increasing the energy level of the affected body part or the whole body. Life energy is steerable and transferable. You can by the will and conscious mental intent targeted to people, Directed animals and objects, are transmitted and controlled. The life energy follows thought there, which focuses our attention. Sick energy is also transferred. It can be transmitted from diseased to healthy people. The energy of a sick person can people, Contaminate animals and objects. Disease exists not only on the physical, but also on the energetic level. Everything, which affects the energy body positively or negatively, also has an effect on the physical body - and vice versa. When the energy body is healed, also heals the physical body. All living things are part of the energy body of the Earth and also connected with the entire universe. Thus we are all connected, also the body of energy therapist with the client's body. The energetic distance therapy is based on this principle of solidarity and unity. In consideration of all these fundamental principles of energy healing offers the PRANA ENERGY THERAPY ® after passing Hubert Leitenbauer effective techniques for activating the self-healing, prophylaxis for health, to protect the body's energy system and the energetic cleansing and energizing of rooms, Objects and articles. Objects can also be programmed spiritually. The special spiral techniques with the associated spiral Farbpranas come only when they are of Hubert Leitenbauer developed PRANA ENERGIE-THERAPIE® applying.